The ginger beer we will be making is a soft drink much like root beer. When creating a commercial ginger beer the manufacturer develops a base drink by adding sugar and flavoring to water, and then infuses it with CO2 using special equipment to give it bubbles. The process described here uses fermentation to create the CO2 bubbles. Fermentation imparts a very small percentage of alcohol, about what you'd find in a non-alcoholic beer or less. If you'd rather not mess with fermentation be sure to check out the page of alternative methods. 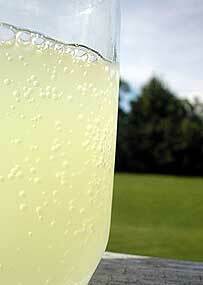 On the other hand if you are looking for non-soft drink recipes then try here. The recipe is very simple and once you get the hang of making it you should feel free to experiment with other flavor combinations. Making root beer uses the same basic recipe with a root beer extract in place of the ginger root. We like our ginger beer with a strong bite. Served on ice it's the perfect refresher after a long day of toiling in the sun.